Norwegian has announced that total traffic for February has grown by 32% and total capacity has increased by 35%, compared to February 2017. The load factor was 84.3%, down two percentage points when compared to the previous year. Bombardier reported that it has entered into an agreement with a syndicate of underwriters, led by Credit Suisse Securities (Canada), National Bank Financial, UBS Securities Canada and TD Securities (collectively "the Underwriters") under which they have agreed to purchase on a bought deal basis from Bombardier 168,000,000 Class B shares (subordinate voting) of Bombardier (the Class B Subordinate Voting Shares) at a purchase price of Cdn$3.80 per Class B Subordinate Voting Share (the Offering). Bombardier has also granted the Underwriters an option to purchase up to an additional 25,200,000 Class B Subordinate Voting Shares at any time up to 30 days after closing of the Offering. Closing of the Offering is expected to occur on or about March 23, 2018, subject to customary closing conditions, including receipt of stock exchange approval. The Offering will result in gross proceeds of Cdn$638.4m to Bombardier (or approximately Cdn$734.1m if the Underwriters’ over-allotment option is exercised in full). Bombardier intends to use the net proceeds of the Offering to supplement its working capital and for general corporate purposes, consistent with Bombardier’s continued proactive approach to capital management. As it executes its five-year turnaround plan, the net proceeds from the Offering will increase Bombardier’s cash position, thereby building further operational flexibility and re-equitizing the balance sheet. Bombardier’s turnaround plan remains on track, focusing on the execution of growth initiatives, with a goal to create long-term shareholder value. UK-based MAC Interiors is getting ready to release Med-View Airlines’ Boeing 767 aircraft following a full cabin modification project. MAC, mostly known for its individual project supplies, has successfully served as a total technical care partner to Med-View covering every spot throughout the aircraft and making sure it is airworthy – both inside and out. The invigorating project started with a galley refurbishment, which is recognised as one of the core competencies of MAC Interiors. Early on, Med-View identified the potential to amplify the scope of the project that had been awarded to MAC Interiors and expanded the project to complete cabin modification; covering the design of the full concept, lavatory updates, installation of surveillance cameras and lighting throughout the entire cabin, production & installation of carpets, curtains and new dividers, stowage installation, GPS installation, as well as the modification of all business, premium and economy class seats. MAC Interiors Board Member, Andrius Norkevičius stated that this is a defining milestone for MAC in terms of the many sub projects serving to one big project; which has granted all the teams, including Magnetic MRO units, the chance to unify forces and execute all of their specialties at once. Speaking of which, major input from Magnetic MRO, owner of MAC Interiors and a global Total Technical Care maintenance and asset management organisation, was provided to support the project. Magnetic MRO design and production teams contributed to the project by manufacturing soft furnishing and modifying interior kits. On account of the joint know-how of Magnetic MRO and MAC Interiors, everything could be completed in-house, cost-effectively and smoothly. 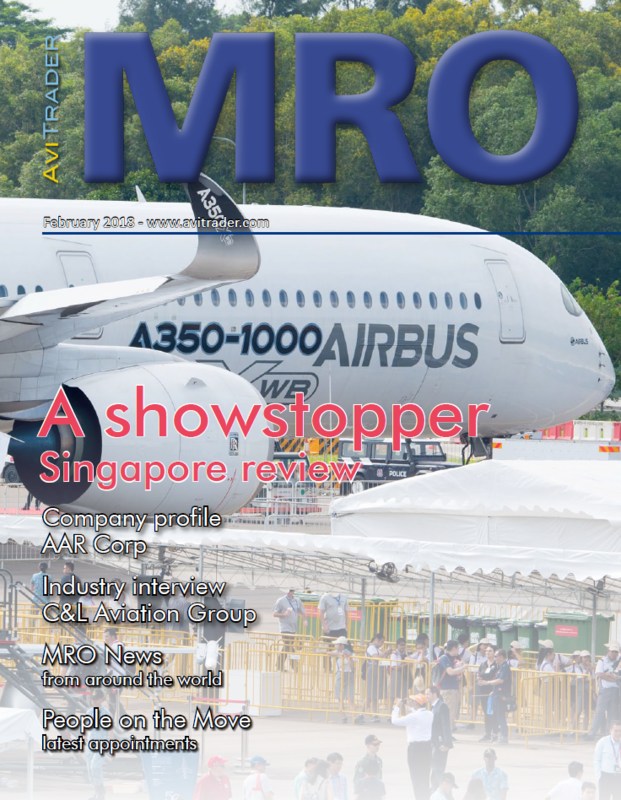 One of the key enablers of the project scope was also the involvement of a local UK MRO. Following the project completion, this cooperation will enable a release of the whole aircraft; unlike the previous times when MAC Interiors was limited to kit supplies. Icelandair Group's Board of Directors has decided to execute a share repurchase program in order to reduce the share capital of the Company. This decision was made following authorisation given by the Annual General Meeting on the 3rd of March 2017, which gave the Board of Directors permission to execute a share repurchase program where up to 10% the Company’s shares would be purchased within a period of 18 months. The share repurchase will at most amount to 50 million shares or 1.00% of the total share capital. Currently, the Company owns 139,460,000 of its own shares, or 2.79% of the total share capital. However, shares will not be purchased in excess of a total value of ISK750m. The share repurchase program will be valid until the end of the 3rd of September 2018. The financial services company Kvika banki hf. will manage and operate the repurchase program, and will make all trade decisions regarding share repurchase and the timing of such purchases independently from the Company. IFS, the global enterprise applications company, has hired Darren Roos as the Chief Executive Officer of IFS. The appointment is effective April 1, 2018 and aligns with the retirement of Alastair Sorbie at the end of the first quarter 2018. IFS is a leading vendor of Enterprise Asset Management (EAM) software to the Aviation & Defence sector globally. The company supplies full-spectrum enterprise, project and programme-centric manufacturing software to tier 1, 2 and 3 manufacturers and vendors serving the Aviation & Defence sector. Start-up Firnas Airways is busy working on its regulatory check-list and securing the necessary finance to formally launch what will be the UK’s newest independent regional airline. It is targeting a third quarter start, initially serving short haul charter services with 19-seat BAE Jetstream 31 aircraft. One aircraft is already painted in its colour scheme and was presented to interested potential investors late last month. “Our investment programme is on schedule and going extremely well,” says entrepreneur and founder CEO Kazi Rahman, who has garnered an impressive team of airline professionals to help him realize his plans, advise and fine-tune its business strategy. 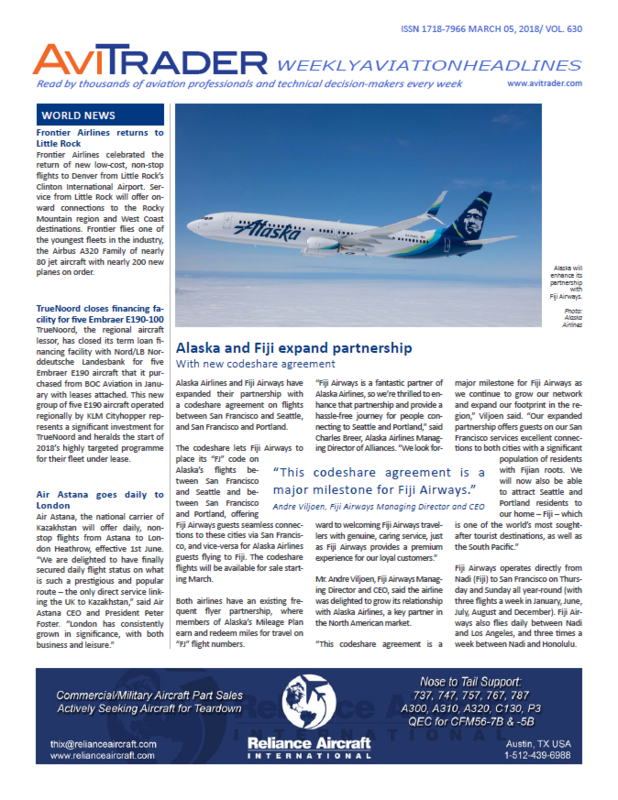 Firnas Airways plans to enter the market and fill a niche, important segment in the sub 50-seat aircraft category, complementing a market dominated by low cost carriers and full service, legacy airlines. Firnas, named after the legendary eighth-century Spanish inventor and scientist Abbas ibn Firnas, lesser known pioneer of the flying machine, has identified unserved and under-served smaller airports with strong catchments, in phase one of its business. It will serve the sort of airports where passengers enjoy short check in times, quick turnarounds and customer friendly service, all on one level. Airports like London Oxford, London Southend, Waterford and Isle of Man Ronaldsway are on the wish list. Cathay Pacific and Air Astana have announced an agreement that will enhance travel options for Cathay Pacific customers traveling to and from Kazakhstan and for Air Astana customers traveling to and from destinations in Asia and Australia via the airlines’ hubs in Hong Kong and Almaty respectively. Commencing March 15, 2018, Cathay Pacific will place its “CX” code on Air Astana’s non-stop flights between Hong Kong and Almaty, the financial and cultural heart of Central Asia, as well as on connecting services between Almaty and Astana, the Kazakh capital. Air Astana currently flies twice weekly between Hong Kong and Almaty, on Tuesdays and Fridays, but will be upping frequency by adding a third service, on Mondays, from March 25. Cathay Pacific will also codeshare on Air Astana’s five weekly services between Bangkok and Almaty (going daily from March 25) and four weekly services between Seoul and Almaty, giving customers additional options for travel between Hong Kong and Kazakhstan. Independent MRO provider Monarch Aircraft Engineering (MAEL) has announced it will double its intake of apprentices in 2018. First launched in 1971, MAEL’s renowned four-year Apprenticeship Scheme has already produced over 750 high calibre engineers for both the company and the wider aviation industry, and this year will double its intake from 20 to 40 apprentices. The expansion of the Apprenticeship Scheme is an integral part of MAEL’s development as a leading, independent MRO provider following its establishment as a stand-alone business in October 2017. Successful applicants will begin their training at MAEL’s Engineering Training Academy at London Luton Airport, before moving to one of MAEL’s bases for “On-the-Job” training in either aircraft mechanical or avionics systems. Chris Dare, Managing Director at Monarch Aircraft Engineering, says: “Our people are our greatest asset and doubling the size of our Apprenticeship Scheme is an investment in our future as a leading, independent MRO provider. All of the apprentices who took part in last year’s scheme were offered positions at MAEL’s aircraft maintenance facilities at London Luton, Birmingham and Gatwick airports following graduation.